I LOVE THE TANNING BED! I have an addiction… the first step is admitting you have a problem, I know this. I’m trying to cut back, which means for me going maybe only once a week. So I’ve been looking for alternatives, and I like what I’ve found. Jergens makes a great lotion: Natural Glow Express. I use this at night because it does still have that salty smell… so you don’t want to use this at the start of your day. Showering in the morning works just fine so you don’t smell like salty self tanner. 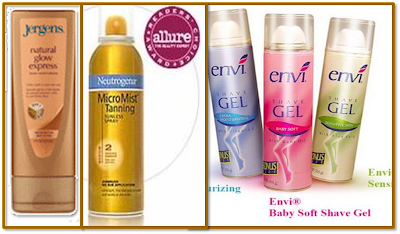 In the mornings I use Neutrogena Micro Mist Tanning spray. It’s great because it is such a fine mist.I’ve been pretty good so far to avoid streaks and splotches so I haven’t had to frantically scour the Internet to find some crazy way to instantly remove self tanner short of bleaching your skin. However, I stumbled upon a remarkable way to, if not remove it, at least even it out a bit. Anyway, as I was using above product this morning, I noticed that most of my tan was coming off as well in the razor… albeit, shaving is an agent of exfoliation. I have now realized that it seemed to even things out and I am not too pale, so I am assuming it did not scrape off any epidermial layers – yes I think I made that word up – thanks House and Grey’s Anatomy. So, there’s my lesson for the day – notsomuch a way to remove, but a good 3 step process to ensure that your self tanning experience does not go the way of Ross Geller. thanks for the tips, Gracie! I had more than enough Ross Geller moments and ended up orange! I have a list of my favorite Friends epis, and that is one of them!